Quaker City Malting (@QCMalt) recently sent me some samples of their QC Malt Lemon Shrub and Old Dutch to try out in new cocktail recipes. I'm not historically fond of malt beverages. My first exposure was back in my youth with Colt 45, then came Zima and it's ilk. None of those ever graced my lips again. Later I tried Mike's Hard Lemonade, expecting a refreshing lightly alcoholic refreshment, I didn't get past the first not-refreshing sip. My experiences had led me to be wary of anything alcoholic labeled "malt". Imagine my surprise when I popped the tops on both these beverages and drank every last drop. I shouldn't have been surprised at my enjoyment of both these products. They are the brainchild of Steven Grasse (@StevenGrasse), father of some of my favorite bar staples including Hendrick's Gin, Sailor Jerry Rum and the beyond excellent Sweet Lips Cherry Bounce from Tamworth Distilling, to mention a few. If Steven puts his name on it, it's just plain quality. The Lemon Shrub was automatically in my wheelhouse as I love shrubs, aka drinking vinegars. These are vinegars infused with fruit juice, herbs or spices and they make lovely mixers and syrups for cocktails. I had high hopes and I was not disappointed. Where the Mike's Hard Lemonade missed, the QC Malt Lemon Shrub hit my not-so-sweet spot. It was lightly tart, brightly lemony and judicious in its sweetness; perfect light alcoholic refreshment for a hot day or night. I had a very hard time saving some for a cocktail recipe, but I did manage to came up with a delicious Blackberry Lemon Shrub Cooler. With the Old Dutch I wasn't too sure what to expect, there's no mention of root beer at all, but - hello! 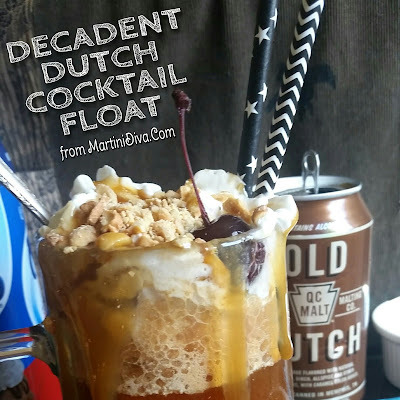 - I immediately wanted to make a boozy float (see below). If you're looking for a root beer style flavored beer, the Old Dutch is exactly where you want to go. I not only finished the whole can, I loved it. 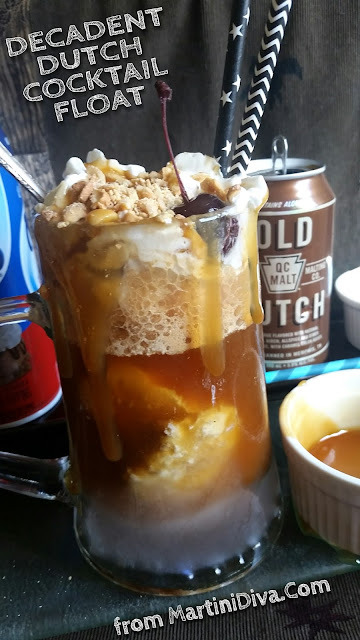 I've tried Not Your Father's Root Beer and couldn't finish it as it was way too sweet. However, though it's not really root beer flavored but a birch sap flavored drink, the Old Dutch brought home the root beer for me. It's less in-your-face than typical "root beer" beers and the lower sweetness is perfectly balanced so the flavors could shine. What a nice surprise! Of course, you had to know the ice cream was coming. INGREDIENTS & DIRECTIONS Take one tall, chilled mug or glass. Add 2 Scoops vanilla ice cream. Pour in Old Dutch. Top with whipped cream. Drizzle with caramel syrup. Sprinkle on crushed cashews. Plop on one Bordeaux cherry. Add ice cream spoon and straws. Get decadent. I must remember to send Steven Grasse hugs and kisses.